The Purpose of this page is to provide some answers to typical questions, as well as some explanations related to the interchange of the two types of transmissions used in the first and second generation of Z Cars (1970-78 and 79-83). What you need to know about your Z and the transmissions you have or plan to buy. Most Common Questions About Swapping Transmissions in the 240Z's. 1. Will a 5spd. from the 280Z or 280ZX fit in my 240Z? 2. What needs to be changed in addition to the transmission when putting a newer style 4spd. or 5spd. in my 240Z. 3. Will the newer style transmissions bolt right into the older Z Cars? 4. Are the shifters interchangeable? 5. What else needs to be changed along with the newer style transmission when installing it in the older style Z Cars? In addition to the redesigned case, the newer transmission had a redesigned shift lever and associated shifting mechanism. This resulted in the shift lever being moved about 2.25 inches toward the front of the car. In turn, the area cut out of the transmission tunnel for the shifter to enter the passenger compartment was also re-located farther forward in the cars produced from 08/71 forward. This in turn drove the need for a redesigned center console with the area for the shift lever also moved forward (the center console for the 72+ model year 240-Z's has the ashtray located behind the shifter). Given the oversized area cut-out in the sheet-metal of the transmission tunnel, for the shift lever in the first place, it is not necessary to remove an additional 2.25 inches of sheet-metal to install the newer style transmission in the older style bodies. Something less than an inch of additional space has to to be provided. That, or the shift lever on the newer style transmission has to be bent in an "S" shape, to provide the necessary clearance. Pictured below: we have the original type "A" transmission in the foreground, lined up with the newer type "B" transmission in the background. Both transmissions are within a small fraction of an inch of each other in total length (within a 1/ 16th inch). Looking a little closer - in the picture below you can see that the centerline of the shifter on the type "A" transmission in the foreground (line #3); sits 2.25 inches behind the center line of the shifter on the type "B" transmission (line #1). Line #2 is the rear end of both the transmissions. The type "B" transmission shown in the pictures above has the Nissan Competition Shifter installed (Part #. As you can see, it is shaped in an "S" curve so that the newer style transmission can be installed in an early style Z car. The stock shift lever is more or less straight on the newer "B" style transmissions. 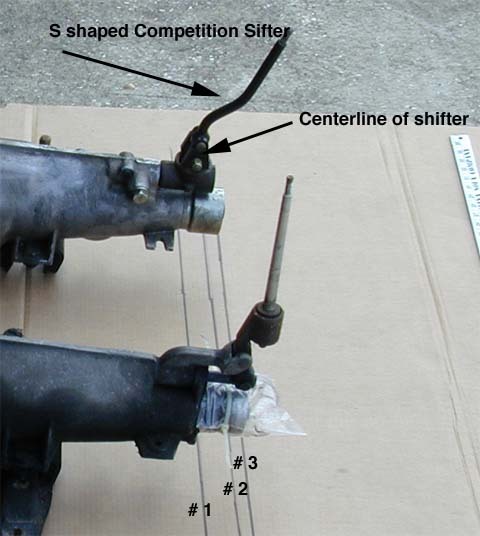 Therefore one needs to either: a) remove additional sheet-metal from the transmission tunnel toward the front of the car, or b) bend the stock shift lever in an "S" curve or, c) order the Nissan Competition Parts "Shift Kit" Part number 99996-E3030 - shown installed in the picture above. Either Transmission: will direct bolt to any of the "L" series six cylinder blocks. The output spline is the same on either transmission - so any drive shaft that fits one, fits the other as far as the output spline is concerned. The shifters are not interchangeable between the type A and Type B transmissions, nor are they interchangable between the 4spd. and 5spd. When installing the newer style "B" transmissions in Z Cars built before 10/71 make sure that you have at least 1/2 inch of clearance ahead of the shift lever when it's in 1st. , 3rd and 5th gear. If the sheet-metal on the transmission tunnel interferes with the shift lever the transmission will pop out of gear, because it was not fully engaging the gear to begin with.